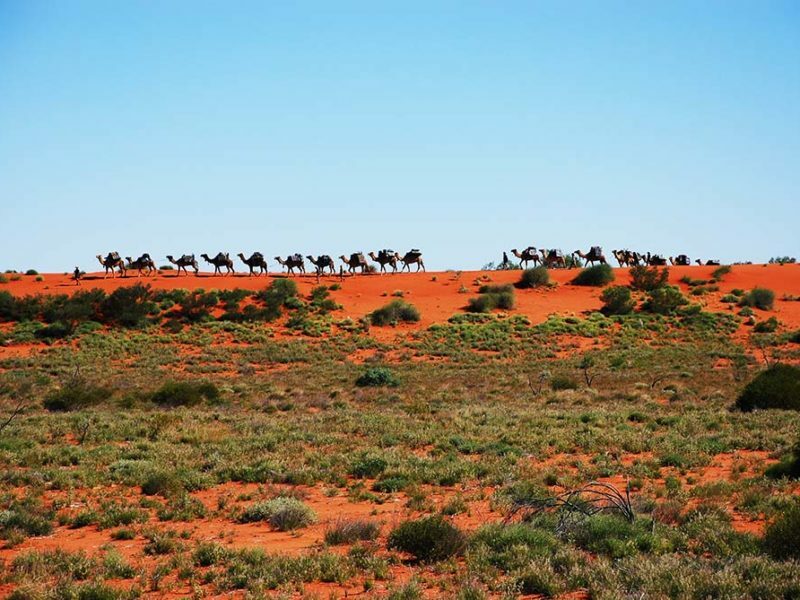 Australian Desert Expeditions partners with Indigenous Australians, leading universities, state and national government land management authorities, and private research institutions to conduct scientific and ecological survey expeditions into remote regions of Australia’s deserts, the largest desert region in the Southern Hemisphere. There are two components to these research surveys: the ecological and scientific documentation, and the desert trekking experience with ADE’s camels. Walking alongside traditionally outfitted pack camels, in the grand tradition of the early explorers and pioneering Afghan cameleers, delivers the smallest environmental footprint possible. Scientists and ecologists will teach you about the extensive desert flora and fauna and the people who have called our deserts home for thousands of years. These expeditions are a direct living link to the historical spirit and cultural heritage of scientific desert exploration of the 19th and 20th centuries. Walking the desert is timeless. Every single step reveals the story of this ancient landscape. With over 40 years of flying its luxury twin-engine aircraft through Australia, Kirkhope Aviation has built an intimate knowledge of the outback and its people, and delivers the most amazing experiences. In 2019, Kirkhope Aviation is again offering its premium all-inclusive signature air safaris. For a short break there is the 3- or 4-day ‘Taste of the Outback’: more than a taste, it is a fully immersive experience, featuring Lake Mungo, Broken Hill, Birdsville, Flinders Ranges and Lake Eyre. For the ultimate in an outback adventure, you can’t go past the 15-day Kimberley & Top End Air Safari or the 13-day Cape York Air Safari. Travelling with a small group in a well-appointed aircraft, the journey is as much fun as the destination! Check out Kirkhope Aviation’s reviews on TripAdvisor. An extraordinary 800-million-year-old natural amphitheatre is situated in the heart of the Ikara-Flinders Ranges National Park, only half a day’s drive north of Adelaide. It’s known as Wilpena Pound (Ikara), and is the traditional homeland of the Adnyamathanha, or Yura people. The only accommodation within the national park, Wilpena Pound Resort offers hotel rooms, ‘glamping’ safari tents and an extensive campground. As one of only a few Aboriginal owned and operated resorts, the hallmark feature of the resort is its Aboriginal cultural experiences. Set off on a journey to uncover the rich history and mystique of ancient and contemporary Aboriginal culture, as Yura guides provide unrivalled insight into their timeless land, one of Australia’s natural wonders. 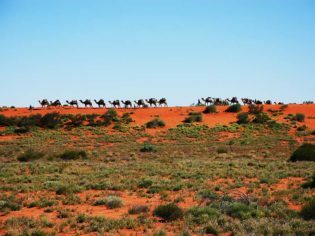 Join a guided Aboriginal cultural walk, a 4WD tour of the surrounding gorges, or a scenic flight over Wilpena Pound, the Flinders Ranges, and Lake Eyre, the world’s largest salt lake. The USAAF arrived in Charleville during WWII. They set up camp here for four years and would spend around $1.4m (1940’s currency) constructing 101 buildings on the site. It was a Top Secret base throughout WWII and even if the enemy knew they were here, they couldn’t get to Charleville and return to their base as Charleville was too far inland. This USAAF base would cover an area of approximately 25 square kilometres south of Charleville and station up to 3500 (Charleville’s population today) personnel on site. So just how do you keep something that large a secret? Book the Top Secret WWII Tour today to discover what the top secret actually was and listen to the story behind it all … it’s fascinating – you won’t be disappointed. Follow your local guide in your own vehicle around what once was a USAAF Top Secret Base inside today’s Top Secret Precinct. The journey is 4 kilometres on some dirt and tar roads just around the Airport area. Home to many ‘Stars and Secrets’. Discover what 3,500 USAAF personnel were doing in Charleville during WWII. They would live and work there from 1942 – 1946. See the remains of their 101 buildings in the base. Learn about our amazing night skies and the secrets they hold. View distant stars, planets and more through large telescopes. Did you know you can even star gaze through the day at the largest star in the solar system?